Chris Rosebrough at Fighting for the Faith has a clever catch line called, "Blue sleeps faster than Tuesday." It is a perfectly constructed sentence. It is grammatically correct. It just doesn't mean anything. When I read a "prophecy" from the Queen of Calamari, Jennifer Leclaire, all I see is blue sleeps faster than Tuesday. You see, Jennifer wants to sound super-spiritual; all the time. She has mastered the art of throwing as many cliche'd Christianese trite sayings against the wall to see what will stick. There is always something shifting in the atmosphere and watch out! Mantles are falling! Seriously, let us reason again together through the above lunacy released by Jennifer this week. Of particular note is the constant reference to bible verses to make this seem biblical but when we do the work of a Berean she is clearly relying on her readers not bothering to actually check what those Scriptures say. Nothing like starting out a good Charismatic prophecy with a reference to the Jewish year that has no relevance to anything. The larger point of course is the misunderstanding of Scripture, in this case the key verse above. Jesus is teaching through this parable a very simple concept. The Scribes and Pharisees represent the old wineskins; the way things have always been done according to the law. Jesus came to change things. 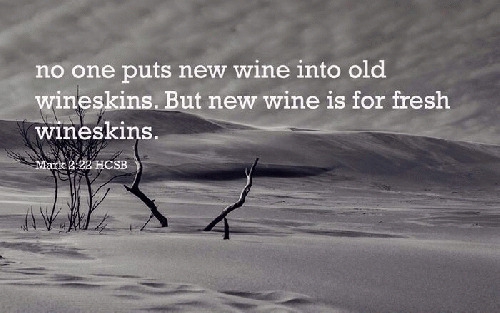 He is the new wine and we are already the new wineskins if we are found in Him. So it is not in "some instances" that we must become the new wineskins. Rather it is integral for salvation! Notice the clever associations she makes without biblical backup. A wineskin holds liquid and Jesus said water would flow from our belly. Therefore new wine will flow from our vessel if we embrace becoming new wineskins. Huh? What does that even mean? Now maybe you could have made a case that she was being allegorical. That when we become saved and are indwelt with the Holy Spirit we can expect the gifts of the spirit to flow from within us except that is not what she is saying. Her claim is that choosing to become this new wineskin must result in changes to how we live, move, and have our being and she offers up Acts 17 as her proof text. The context, a concept foreign to Jennifer Leclaire, is Paul speaking to the unsaved men of Athens. This is the end of the contrast he makes regarding an "unknown God" they worshipped and the one true living God. Paul points out that God made all mankind and every nation. He teaches that despite how we might feel, God is not actually that far from us because in Him we live, move and have our being. Paul is speaking about all of creation, not merely those saved. To bring it home for them he quotes a philosopher /writer they would know who posited that we are all His offspring. He goes on to teach that therefore we should not think of God in idolatrous terms such as silver and gold. Beloved, the point here is that this entire exchange is about Paul preaching the Gospel to the unsaved men of Athens. It has absolutely nothing to do with the parable of the wineskins, the outpouring of the Holy Spirit, or any of the hyper-charismatic gobbledygook Jennifer Leclaire is going to claim. So despite the musings of her wickedly deceitful heart, the "new wine" does not mean new creativity, methods or a redesign of church. You see this a lot in these circles because they are in such rebellion to God they are constantly trying to overthrow what He has designed. They will slap a snazzy super spiritual tagline on it such as, "spirit of innovation or accelerated growth" but at the end of the day it is just Lucifer wanting to ascend to throne of the Almighty. Sorry to disappoint you but the Holy Spirit is not breathing a wind of momentum into your work. If you allow Him, He can lead you into all truth found within Scripture to set you free from charlatans like Jennifer Leclaire.